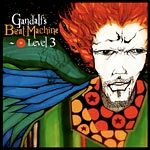 It was eight years since the last Beat Machine came out and Eligh no doubt was busy with his crew and his own solo work along with side projects and plenty of production duties in the time that passed. But under the persona of Gandalf, the Living Legends member has always brought something different to the table. These are abstract extractions of sonic sounds and samples and pieced together by an artist with no limits. Eligh's lyrics are poetry on paper, but part of Gandalf's poetry is his production and the only way to enjoy it is for it to be heard. Aside from maybe a little Berlin moment, this is a perfect fit in the Beat Machine series and you'll notice perhaps that it's a little more advanced as it's been so long since the previous two. Sure to be considered a new classic amongst fans and overall a dope and often trippy instrumental album. This album is dope. Its a soundtrack for life. Get it.